It's definitely a little early but you can send it my way! However, I would only submit the one you want in the 800th the most to have that comment. The others can just be normal submissions and will go in other issues but submitting 5 different comics with the comment that you want it in the 800th won't help your chances. Ah good question! For those of you that don't know, our collab issues are basically themed issues. You guys get to pick the theme you want to do, you let me know and we make it happen! For further reference you can go check out some of our past ones: 668, 715 or 772. Well, just like you guys we LOVEEEEE to play in Altador Cup. We have our tournament pretty much the same way you guys have yours. Of course, we love to play all of the games but nothing beats that healthy competition we have when playing Yooyuball. I'm not gonna lie, our games can get pretty intense *cough cough DJ Skellington cough* but it's all in good fun! 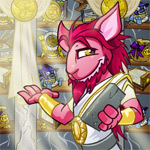 Let me start by saying, I swear to all of you that NO NEOPIANS OR PETPETS HAVE BEEN HURT IN ALTADOR CUP!! I know many of you might be worried but we have done extensive planning and precautions are in place for our cute little buddies. The Yooyu's have protections (thanks to our very own Fyora and scholars of Neopia) that allow explosions to not cause them any harm. As for the surrounding players, they might come away with a scratch or bruise but hey, they're tough right? You can run for now. But you can't hide from those who made you, not even Redford could deny that, so I'll find you. Hunt you down if I must. You'll never truly escape.